Trans fat free. Milky & fruity. 8 pack. www.bing.co.kr. Made in Korea. Dairy-free. Gluten-free. Vegan. Non-GMO. 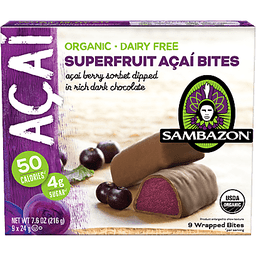 www.Sambazon.com. Certified organic by QAI. Dairy-free + vegan with healthy omegas and antioxidants. Born of the Amazon. 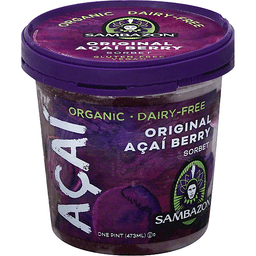 Acai is a delicious purple berry that grows on the banks of the Amazon. Long treasured by natives for its restorative powers, acai is widely considered to be one of the healthiest foods on the planet. We harvest our acai sustainably, in ways that nurture and enrich the Amazon - which means it's not only good for you, it's good for our planet. So pop the top and enjoy a little taste of Brazil. USDA organic. Non GMO Project verified. nongmoproject.org. Vegan & gluten free. Approved fair trade by Ecocert. Acai supply chain. Fair Trade approved by Ecocert Environment according to ESR standards available at www.ecocert.com. Made in USA. USDA Organic. Gluten-soy and dairy free. Non GMO. A California corporation. Vegan & gluten free. Certified Organic by OEFFA. ORAC: Over 42,000 per 1.42 l. 16 g sugar per serving. 140 calories per serving. Omegas 3, 6, 9. Organic USDA. 100% vegan. Gluten free. Dairy free. More than berry Acai roots a lifestyle! Absolutely all acai no other fruit added. 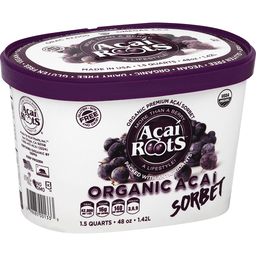 Create Your Own Recipes with Ready-To-Eat Acai: You're looking at another first from Acai Roots in San Diego; Our half-gallon container of Acai sorbet is unique - just like the recipes you can invent with the 64 ounces of delicious acai inside! Create your own original smoothies and bowls, or enjoy it as is for a healthy snack. There's nothing else like it! For delicious and healthy recipes visit us at acairoots.com. Acai Berry: The acai berry grows in the Brazilian rainforest in some of the richest soil on the planet. The dark purple berry looks similar to a grape or a blueberry. Unlike many berries acai is 90% seed and only the skin around the seed is edible. Some Important Properties of The Acai Berry: Antioxidants - omegas - fatty acids - phytosterols - dietary fibers - protein - calcium - iron. 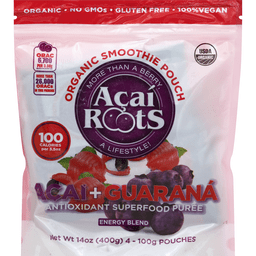 Acai Roots - The Antioxidant Powerhouse: The most important nutritional benefit of Acai is the vast amount of Antioxidants, as measured by ORAC (Oxygen Radical Absorbance Capacity). A higher ORAC value provides greater antioxidant power. 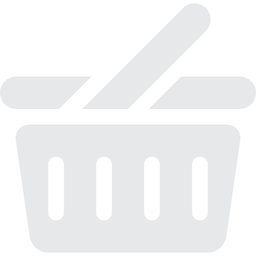 Our daily requirement is estimated at 3000 to 5000 ORAC units per day. We include ORAC values on all our labels, so that you can see for yourself the health benefits that correspond to high levels of acai in the product. 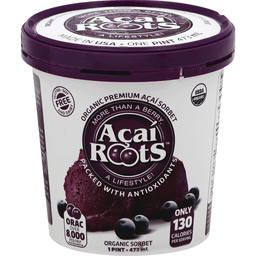 Premium Fuel for Your Active Lifestyle: Acai Roots, a California corporation based in San Diego was founded in 2005. Their goal was to deliver the great taste of Acai while maintaining its unique health benefits and never sacrificing quality. Absolutely all acai no other fruit added! 1-866-401-Acai (2224). Made in USA. Frozen dairy treat. Strawberry Vanilla; Honeydew Melon; Strawberry Banana. 0 trans fats. Gluten free. Refreshing and delicious! 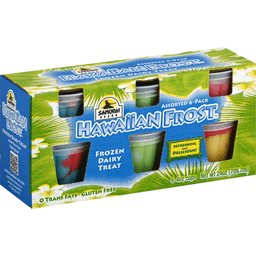 From the midst of Honolulu comes a delicious icy-creamy treat called Hawaiian Frost. 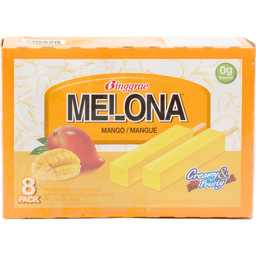 This box contains Strawberry Vanilla, Strawberry Banana and Honeydew Melon. Contact us to try the other flavors! But be warned. You may become addicted. Visit us at www.samurai-inc.com. Artificial flavor added. Creamy & fruity. 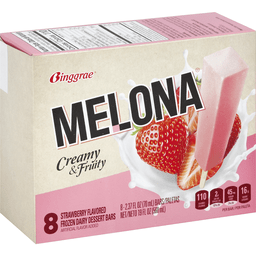 Per Bar: 110 calories; 2 g sat fat (10% DV); 45 mg sodium (2% DV); 16 g sugars. Made in USA. Naturally flavored. Creamy & fruity. Gluten free. No high fructose corn syrup. 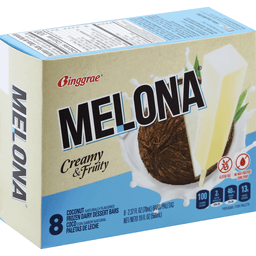 Per Bar: 100 calories; 2 g sat fat (10% DV); 40 mg sodium (2% DV); 13 g sugars. Not for individual sale. Facebook. Instagram. Twitter. Follow enjoyMelona! 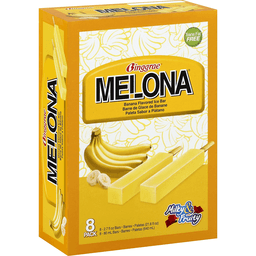 Tag (at)EnjoyMelona and hashtag EnjoyMelona to show us how much you love fruity & creamy Melona bars!. 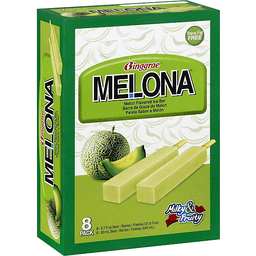 www.melonaicecream.com. Made in USA. 16 x 4 - pack. Organic smoothie pouch. Antioxidant superfood puree. More than a berry. A life style! In This Box: Orac 26,000; Omega 3, 6, 9; Gluten free. 100% Vegan. USDA Organic. Certified organic by CCOF. No GMO. Orac 6,100 per 3.50 oz. Source: Brunswick lab. A simple blend of coconut cream & shredded coconut. Dairy free. Non GMO Project verified. nongmoproject.org. Gluten-free. Please recycle. Ciao Bella is Italian for hello beautiful. Well, say hello to the most delectable dessert experience you have ever tasted! Our gelato and sorbetto creations are crafted with the highest standards of deliciousness as well as the finest ingredients. 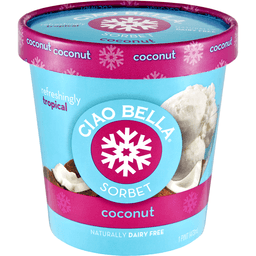 Our Coconut Sorbetto features rich coconut cream and shredded coconut for an intense tropical treat. 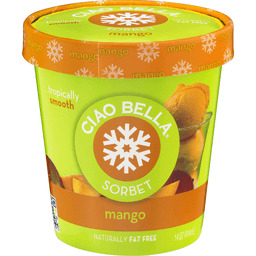 Indulge freely as our sorbetto is dairy-free and Non-GMO Project verified. Learn more at Ciaobellagelato.com. Crafted with perfectly ripened Alphonso mangoes. Dairy free. Non GMO Project verified. nongmoproject.org. Fat free. Gluten-free. Please recycle. Ciao Bella is Italian for hello beautiful. Well, say hello to the most delectable dessert experience you have ever tasted! Our gelato and sorbetto creations are crafted with the highest standards of deliciousness as well as the finest ingredients. Our Mango Sorbetto uses the finest and ripest Alphonso Mangoes. Indulge freely as our sorbetto is dairy-free and Non-GMO Project verified. Learn more at Ciaobellagelato.com.